Matbuha is a “cooked salad” that is a divine combination of roasted peppers, tomatoes, chiles, garlic and olive oil. Simplicity is Queen! 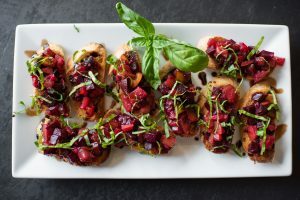 Beets electrify classic Italian bruschetta, bringing not only glorious color, but earthy sweetness and nutrition too! 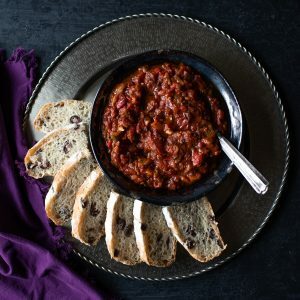 Until the Melissa’s Produce demo with Jill Nussinow and the Sitram Stainless Steel Sitrapro pressure cooker, I was terrified of those ticking time bombs, but NO MORE! 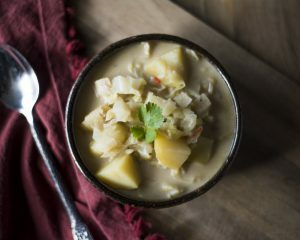 With Jill’s new book, Vegan Under Pressure, it takes the terror out of pressure cooking. 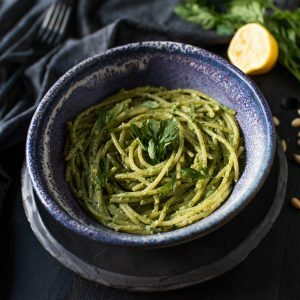 You don’t need basil or parsley to make a pesto. 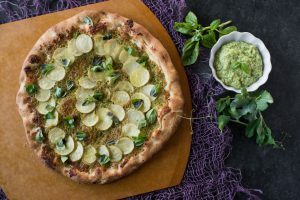 Use sugar snap peas, pine nuts and nutritional yeast to make this delightful sauce for your next pizza.